Sony is taking the lead in bringing the focus on audio performance to the camcorder market with its new 2006 Handycam models. Nothing preserves memories better than moving images with sound," said Linda Vuolo, director for camcorder products at Sony Electronics. "We are offering new enhancements to both audio and video performance in our 2006 product line." On the digital tape front, four new miniDV models aim to please cost-conscious video enthusiasts with prices beginning at about $350. All the miniDV models deliver a powerful combination of precise image detail and vivid color reproduction thanks to Carl Zeiss optics and Sony's high-resolution CCD imaging technology. Sony HC36 - miniDV camcorder - The new Sony DCR HC36 camcorder features top-side tape loading so it's effortless to replace tapes while shooting from a tripod. Furthermore the Sony HC36 incorporates a 680K-pixel Advanced HAD CCD image sensor a Carl Zeiss Vario-Tessar lens, a Memory Stick Duo media slot and supplied remote. To view the moments the miniDV camcorder offers a 2.5-inch hybrid SwivelScreen touch panel LCD and a color viewfinder. 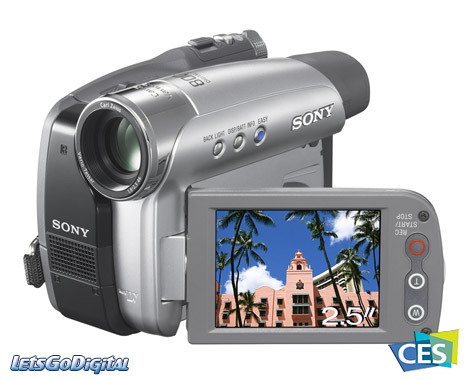 The new Sony DCR-HC36 miniDV camcorder is available in February for only about $400. Sony DCR-HC36 - Stamina technology - The Sony HC36 miniDV camcorder features the Stamina technology you have come to expect from Sony, meaning you should never miss that special moment. The HC36 features Sony's unique Easy Handycam menu, providing one-button access to simplified camera operation and recording settings. It locks out the more advanced features of the menu, giving the user a quick and easy selection of basic settings to choose from. These are displayed on the LCD screen in large, easy to read characters and are ideally suited to the first time movie-maker. Sony Handycam - Camcorder accessories - Sony provides a wide variety of accessories to maximise the Handycam shooting experience and address the diverse needs of all customers. 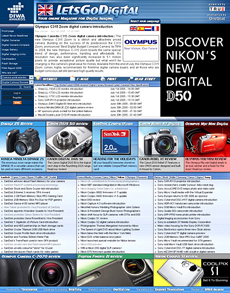 All potential requirements are covered, from lenses to microphones, from lights to high-power batteries and from tripods to stylish carrying cases. A new addition to the camcorder accessory line from Sony in 2006 include: the exciting ECM-HW1 wireless microphone, using Bluetooth technology, is designed to add further depth and clarity to your audio recording by being easily attached to your subject by clipping onto the clothes, worn around the arm, around the neck or placed nearby. The microphone communicates with the receiver unit wirelessly at up to 30M distance. This new microphone from Sony may not be available in some countries due to the wireless technology regulations. Sony accessories - Battery and Sports pack - The ACC-FP71 value accessory kit contains three indispensable items to accompany your camcorder, offering a saving of more than 25 per cent on the price of buying them separately. The kit contains the NP-FP71 high capacity battery, the LCS-VAC carrying case and shoulder belt. Sony also offers LCM-HCF, a new Semi Soft Carrying Case for easy storage and carrying of your Handycam, this is available for all new miniDV Handycam models. Sony ranges the SPK-HCB Sports Pack. The Sony Sports Pack is compatible with all new 2006 Handycam models, and offers waterproofing up to 5metres. The HVL-10NH is a high power 10w light. Compatible with all new Handycam models, it is supplied with an Accessory Shoe Adaptor.